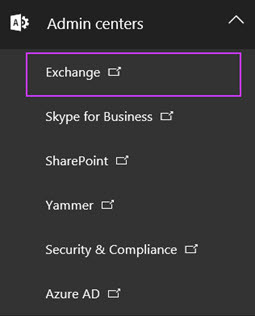 You use the Exchange admin center to manage email settings for your organization. You must have Microsoft 365 admin permissions to access the Exchange admin center. Sign in to Office 365 using your work or school account, and then choose the Admin tile. In the Microsoft 365 admin center, choose Admin centers > Exchange. You can also get to the Exchange admin center directly by using a URL. To do this, go to https://outlook.office365.com/ecp and sign in using your credentials. Be sure to use a private browsing session (not a regular session) to access the Exchange admin center using the direct URL. This will prevent the credential that you are currently logged on with from being used. To open an InPrivate Browsing session in Microsoft Edge or Internet Explorer or a Private Browsing session in Mozilla FireFox, press CTRL+SHIFT+P. To open a private browsing session in Google Chrome (called an incognito window), press CTRL+SHIFT+N. 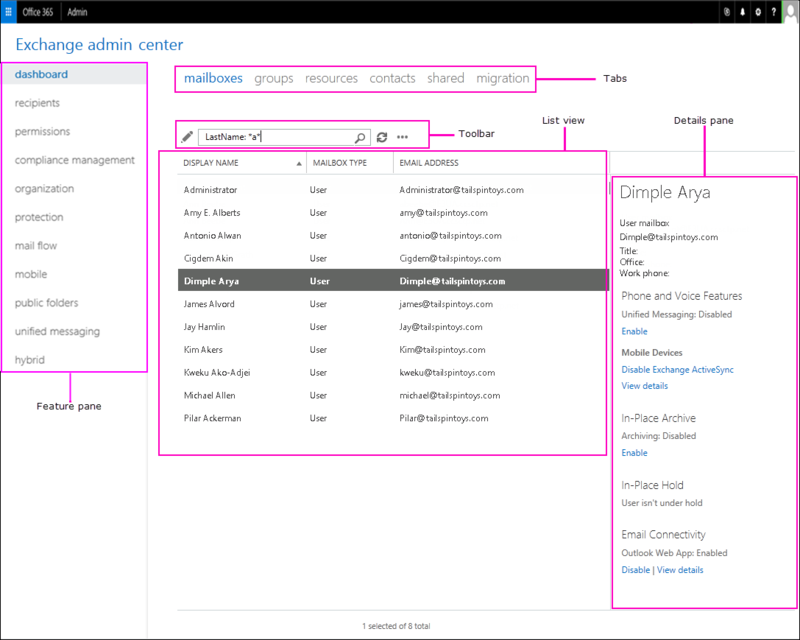 Here's what the Exchange admin center looks like. Here are the features you'll find in the left-hand navigation. Dashboard An overview of the admin center. Recipients View and manage your mailboxes, groups, resource mailboxes, contacts, shared mailboxes, and mailbox migrations. Permissions Manage administrator roles, user roles, and Outlook Web App policies. Compliance management Manage In-Place eDiscovery & Hold, auditing, data loss prevention (DLP), retention policies, retention tags, and journal rules. Protection Manage malware filters, connection filters, content filters, outbound spam, and quarantine for your organization. Mail flow Manage rules, message tracing, accepted domains, remote domains, and connectors. Mobile Manage the mobile devices that you allow to connect to your organization. You can manage mobile device access and mobile device mailbox policies. Public folders Manage public folders and public folder mailboxes. Unified messaging Manage Unified Messaging (UM) dial plans and UM IP gateways. The tabs are your second level of navigation. Each of the feature areas contains various tabs, each representing a complete feature. When you click most tabs, you'll see a toolbar. The toolbar has icons that perform a specific action. The following table describes the most common icons and their actions. To display the action associated with an icon, simply hover over the icon. Add, New Create a new object. Some of these icons have an associated down arrow you can click to show additional objects you can create. For example, in Recipients > Groups, clicking the down arrow displays Distribution group, Security group, and Dynamic distribution group as additional options. Delete Delete an object. Some delete icons have a down arrow you can click to show additional options. Search Open a search box in which you can type the search phrase for an object you want to find. n/a Upgrade a distribution group to an Office 365 group. This icon can be used only for a distribution group. Refresh Refresh the list view. More options View more actions you can perform for that tab's objects. For example, in Recipients > Mailboxes clicking this icon shows the following options: Add/Remove columns, Deleted mailboxes, Export data to a CSV file, and Advanced search. Up arrow and down arrow Move an object's priority up or down. For example, in Mail flow > Rules click the up arrow to raise the priority of a rule. You can also use these arrows to navigate the public folder hierarchy. Copy Copy an object so you can make changes to it without changing the original object. For example, in Permissions > Admin roles, select a role from the list view, and then click this icon to create a new role group based on an existing one. Remove Remove an item from a list. For example, in the Public Folder Permissions dialog box, you can remove users from the list of users allowed to access the public folder by selecting the user and clicking this icon. When you select a tab, in most cases you'll see a list view. The list view in Exchange admin center is designed to remove limitations that existed in Exchange Control Panel. In Exchange Online, the viewable limit from within the Exchange admin center list view is approximately 10,000 objects. In addition, paging is included so you can page to the results. In the Recipients list view, you can also configure page size and export the data to a CSV file. When you select an item from the list view, information about that object is displayed in the details pane. To bulk edit several items: press the CTRL key, select the objects you want to bulk edit, and use the options in the details pane. Help: Click to view the online help content. Disable Help bubble: The Help bubble displays contextual help for fields when you create or edit and object. You can turn off the Help bubble help or turn it on if it has been disabled. Office 365 System Requirements: lists supported browsers for Office 365 and the Exchange admin center. Supported Browsers for Outlook on the web. Are you using Exchange Server? See Exchange admin center in Exchange Server. Are you using Exchange Online Protection? See Exchange admin center in Exchange Online Protection.